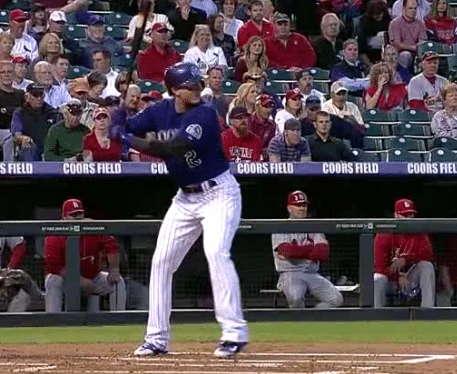 You are here: Home / Topics / Get On-Time / Troy Tulowitzki VIDEO: Stride Killing Bat Speed? Joey … this goes to show you that the principles of motion will effect everything equally. The unweighting principle applies to our bodies in the same way it applies to a car. Note that there are always city and highway gas MPH given – because once you get the car moving on the highway it takes less energy to keep it going, or to go faster, than it does stopping and starting in the city. Once again you’ve made your point in expert fashion. Great presentation. In your forward momentum swing, you’re making contact with your back foot way off the ground and coming forward, whereas the no stride swing the back foot stays on the ground for the most part. if you look at tulo’s swing and pedroia’s swing, they have a big stride forward, but on their load, their feet are almost together, so when they stride they don’t end up so far out that their back-foot has to catch up. the only hitter that i’ve really come across that swings you’re way is trout. what impact do you think this makes on the swing and the results of your experiment? Hey Jake. Good observation. I may have to revisit the forward momentum (or un-weighting) part of the experiment. Dedicate one day to just that to really get an idea of increased bat speed. There are other small-bopper hitters who’s back foot comes off the ground and trails the front one: Jose Bautista, Robinson Cano, and Babe Ruth to name a few. Ted Williams back foot actually skipped towards the plate. The important thing is that backside carries zero weight during the swing. The back foot trailing the front helps the hitter gain more stability in the follow through. The farther apart the feet are, the more muscle needed to stabilize in the upper legs (mainly the quads). The more muscle that turns on, the slower the swing. Do you find your Zepp useful for anything other than bat speed? If so, what? What other ways do you use it? Yes, I’ve used it sparingly so far because I’ve been so busy. The new update allows you to measure ball exit speed and distance the ball traveled now. I don’t think my android app updated yet, but the Apple one has. I still haven’t figured it out yet, but you can track and manage different hitters in the app. This is huge for “what’s measurable, is manageable” when it comes to training hitters. Also, in future articles, I’m going to be running movement experiments with it like I did in the Troy Tulowitzki blog article. Just the fact you can tinker with certain movements, and test to see what the change brings is a big deal. I know $150 is a lot to spend on it, but if you’re interested in the feedback it provides, then it’s well worth it. I bought it when it came out and used it with my son’s training sessions. It certainly collects a lot of data. But without anything to relate that data to, I don’t know if it was a good swing or not or what to look for and improve. I’m also not sure I trust the accuracy. I often readings that don’t match up with the eye test. For instance, I’ll swing path animations that are completely wacky (they look like someone was chopping wood when I saw them take a normal swing). Essentially, all I really use it for is swing and hand speed. I was hoping to get more out of it. I know they are constantly working on it so I’ll be patient. I just wanted to hear more about others experiences and learn from them. Keep up the good work here. I just discovered your site and love what I’m reading/watching. Wow… Just read my last post… sorry for the grammar issues. Please comment on Albert Pujols “no-stride” swing technique and bat speed and his effectiveness as a hitter in light of what you have concluded after analyzing Tulo’s forward momentum/long stride swing for increased bat speed. I teach no-stride to young kids 7-12 due to the complexities that the stride creates for them namely, premature weight shift to front side and head movement with the resulting “eye drop”. In my opinion, from a teaching stand point at an early age, No-stride allows them to keep the weight back and head (eyes) still. These are the two primary deficiencies that should be eliminated or prevented before they are older and/or reach a phase of physical maturity (body control) and an understanding that forward momentum with a longer stride increases bat speed. I would greatly appreciate your comments on Pujols no-stride. Thank you and keep up the good work!! Otto, I applaud your effort in thinking of the kids first. I think the problem us coaches have at an early competitive level, is to be too focused on outcomes versus the process. I know how competitive it is at the younger levels, my parents and coaches tell me all about it. And I go to a few tournaments of my hitters, and can feel the pressure around the complex. I don’t like the wide no-stride and sitting back approaches. Forward momentum is one of the first things I teach my 7-9 year olds. It does require some timing calibration, but if you read the “Coaching Baseball” post I did on the Art of Variance, timing is fairly simple for a coach to teach. Al, I think this is a complex issue, going far beyond a purely rotational/linear v. a combination of the two. I think we’re dealing with mechanical challenges…I think vision and tracking plays a role…increased pitching velocity…increase in higher level athletes not focusing on range of motion…mental strategy…I could go on and on. The best thing to do is study the high average, high power swings and see what they all have in common.